A captive portal, also known as a WiFi landing page, refers to a web page that users are required to see and interact with prior to being given access to a network or the internet. They are usually found in restaurants, coffee shops and retail locations offering free guest WiFi internet access. 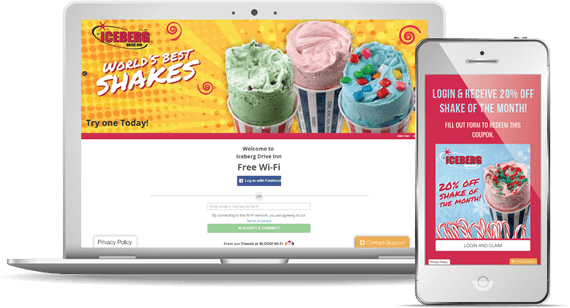 From a user’s point of view, the captive portal is simply the login page for accessing the internet on public WiFi networks. They can log in using their email address, Facebook account, or through a full registration process. Bloom Intelligence gives businesses powerful captive portals. They allow marketers to build detailed customer profiles or ask customers to do certain things, such as liking your Facebook page, before they gain full access to the internet. Build your customer database faster. Bloom Intelligence customers are collecting 100,000’s of verified customer profiles a year. Then, they either use this data to send offers, messages or surveys in the Bloom platform or use third party platforms that Bloom integrates with such as a loyalty program, mobile app, or a email service provider. Make better decisions. Data collection has become necessary in today’s business world, and for good reason. Captive portals provide your business with valuable customer data that can then be used to make data-driven business decisions. Additionally, they can be used for direct advertising of specials, events and promotions. Automate marketing efforts. Once you capture a customer’s profile information, which includes a verified email, name, phone number, zip code, birthday and the customer’s behavior at your locations, you can then automate marketing to your guests with offers, messages, and surveys based upon their data and behavior. Improve marketing results. Knowing who your customers are and how they behave while at your establishment will allow you to segment your customer contact database by demographics and behavior data. This allows you to create more targeted marketing messages to each segment, improving ROI and customer engagement. Identify churning customers. Captive portals allow business owners to see which customers are at a high risk of churning. By identifying these customers, you can send them an offer or coupon as incentive to come back to your establishment. Promote your brand. You can display your own branded images, promotions, ads, or events. When designed properly, the portal becomes an extension of your brand voice and image, reinforcing brand identity. It’s a great opportunity to showcase your company’s unique personality. In addition to all of these valuable benefits, using a captive portal also helps you control your gateway to the web. You can regulate which users can access the web, what pages they can view, and under what conditions. For instance, you can turn on bandwidth limitations to prevent slow service during peak traffic times. Another benefit to your business is the liability protection. In other words, when a customer logs in through your portal, you can require them to agree to a terms and conditions agreement and acceptable use policy. Should a user do anything malicious or illegal using your internet connection, you’ve stated your right to take legal action. Bloom Intelligence customers enjoy white-glove service, including the creation of your WiFi landing page. Once signed up, your dedicated Customer Success Manager will contact you to begin the design of your new captive portal. You choose which functionality you’d like on the page, send us your logo and images, and tell us what you would like to communicate to your guests. Then, our professional designers will create your page and send you a preview for approval. After that, Bloom will update your design, message, and functionality at any time for no additional charge. If you’re interested in learning more about Bloom’s captive portals and WiFi analytics and marketing platform, schedule a demo today.